Thornhill lost me. I really enjoyed Peacock’s debut novel Hemlock. I thought it was a fresh and interesting take of the werewolf mythos. What if being a werewolf was really just a disease called lupine syndrome and the government got involved and started shipping those infected off to camps? Well, that is the premise of Hemlock. In the first novel I liked Mac but in this novel she reminded me of a kid sister that kept trying to tag along with her older, more capable, siblings. She was just slowing things down. I found myself disliking her because she kept inserting herself in to situations clearly meant only for werewolves. You know, I think cats are adorable but I don’t walk around flopping on my belly asking for pets. At a certain point you need to throw in the towel and be happy with what you are rather then screwing things up for everyone. I also found the love triangle in this installment to be markedly more bothersome. It isn’t that Mac’s affections are split, the opposite actually. She knows who she prefers, the problem is that I’m not convinced Kyle likes her. And while Kyle is busy pushing Mac away Jason is just there being a pretty decent guy. My other qualm with this book is that Mac is still being haunted by the ghost of her dead friend whose murder she solved in the first book. What I thought was a cool part of the story became rather weird in the second book. Amy didn’t really have a place in Thornhill. I had kind of assumed her story arc was completed. 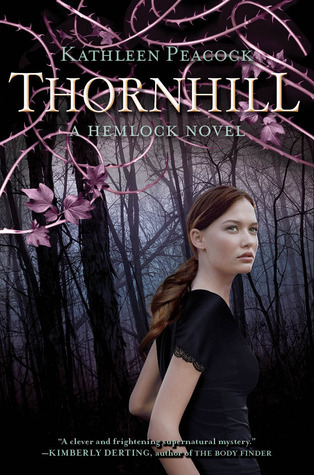 Overall, Thornhill wasn’t a bad book. It was well written and engaging but there were too many issues with characters and plot took away from the story. At this point I’m not sure if I will be continuing the series but if I see some positive reviews I’ll be willing to give it a try. Seven Nation Army by The White Stripes (White Panda Reboot) - This is also on Kathleen's playlist it reminds me of all the werewolf packs that we are introduced to in this novel and the party scene. I'm recommending the White Panda reboot because it's a little bit faster and also because I love White Panda. Folsom Prison Blues by Johnny Cash- The majority of this novel is set in a werewolf prison camp and this song just feels appropriate for that situation. Also, Johnny Cash.